Would you know what a Chinese Privet is? You most likely have it in your yard or up against a building or a fence. It was introduced into this country in 1852. It was imported because they make a great looking hedge for privacy and adornment or decoration. Chinese Privet: A bush often used for hedges. 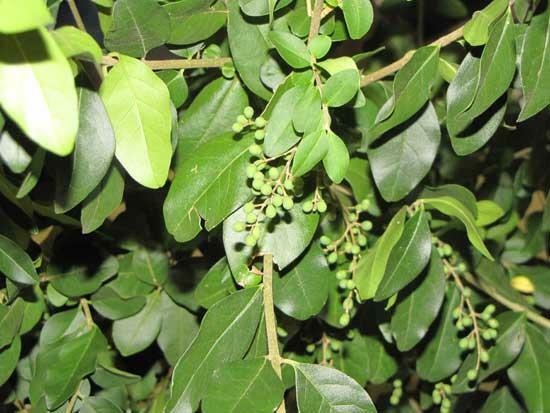 It is a bush with small, dark green leaves that is often used for hedges. Pam Hoskins of the United States Department of Agriculture, Natural Resources Conservation Service (USDA-NRCS) held a meeting to introduce a new project to slowly replace this plant; no she is not advocating the termination of this species by herbicide, but by edging out this plant with native species of plants; sort of like attrition. Hoskins, with the help of the Stones River Watershed Association and horticultural students from classes taught by Courtney Nichols of Cannon County High School will have as their initial project, the planting and maintaining of native species of flowers, plants and trees in Dillon Park. Hoskins explains that the reason no herbicide will be used is that a lot of these bushes are growing alongside the Stones River (thus riparian) here in Cannon County. No one involved with the project wants to endanger the water with poisons. Cannon County gets all its water from the Stones River. Hoskin said the plant “has no known enemy” and is resistant to insects, and lets nothing grow beneath it. The one thing that it does do at this time is to slow down the amount of erosion on the river banks because of its massive root system. That is also why it is not just eradicated; doing so without another plant to replace it would cause the river banks to drop off into the river and wash away with the current. Students from the horticultural classes gave a power point demonstration on what action that will be taken to bring about the change needed to stop the encroachment of the plant. They along with many volunteers will be planting native plants and trees, flowers and grasses beside the Chinese invader, we cannot lose our rich supply of native flora to the imported plants that are endangering the growth of our native plants. Allison and Amelia Higgins and Ryan Haley were those students. Stones River Watershed Association is a partner in the project. Locally Neal Applebaum will be the liaison in this venture. He is bringing with him those of them who have already contributed so much for the preservation of the waterway known as Stones River. The Stones River starts right here in Cannon County and is a large contributor to Percy Priest Lake where the river ends on the outside of Nashville. At the meeting was another member of the Watershed Association, Terri Hogan, who works with the Stones River National Battlefield in Murfreesboro. Ms. Hogan monitors “invasive species” on that reservation. She spoke at this meeting telling about the plant that rapidly grows and is in most if not all the Southeastern United States because of ideal growing conditions for the plant. The residents of Woodbury and Cannon County will be seeing a lot if work around Dillon Park for upcoming months; if you would like to volunteer to help you can contact Pam Hoskins at the USDA office on Old McMinnville Highway, right before you get to the Cannon Manor.